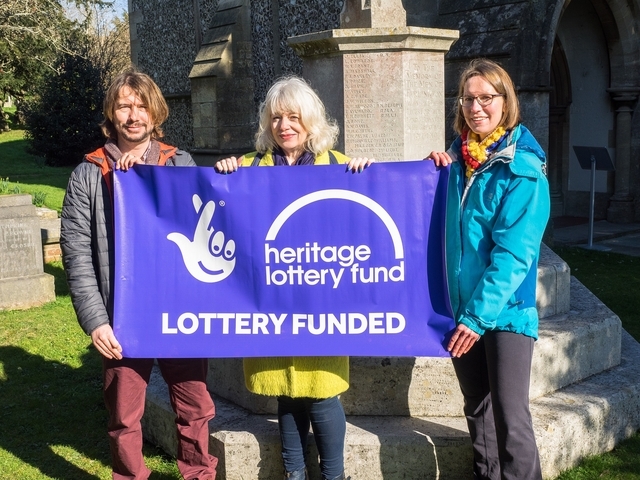 (l to r): Paul Jones, Clare Jefferson Jones, both from Splodge Designs, and Julie Minter, project coordinator, at St Andrew's Church, Farlington. People of all ages will be involved in a project to mark 100 years since the end of the First World War thanks to a £10,000 cash injection from the Heritage Lottery Fund. The project called Honouring Farlington’s Fallen will involve researching the lives of the 51 men listed on the Farlington First World War memorial in St Andrew’s Churchyard in Havant Road and responding creatively to their stories. The project was devised by the Church of England parish of Farlington and Splodge Designs, a Hayling Island-based creative and inclusive arts company. And it will involve Solent Junior School, 2nd Farlington Guides, 70th Portsmouth (1st Drayton) Scout Group, members of Portsdown U3A and Alexandra Rose Care Home and other individuals interested in community heritage. Clare Jefferson-Jones from Splodge Designs said: “This will be a wonderful opportunity for local groups and schools to commemorate the end of the First World War and to research and develop work around the memorial in Farlington. “Over the last 17 years Splodge Designs has shared its skills through community participation across the generations covering all abilities to create individual works, commissions, and site-specific installations. “Splodge has been particularly active in working on heritage projects to find ways for local schools, groups and residential homes to creatively learn more about their local heritage. The information discovered through the research will be used to develop interactive teaching sessions and workshops for the schoolchildren, uniformed groups and care home residents and they will then have the opportunity to help create two pieces of artwork: a fabric banner to hang inside St Andrew’s Church and a piece of artwork which it is hoped will be sited outside the Church of the Resurrection in Drayton. The project will also involve creating a website to tell the stories of the men through words, pictures and audio soundtracks voiced by those involved in the project. Photos of the two pieces of artwork will also be on there. There will also be leaflets produced to share the stories of the men which will be available from the church and in the local community. Project Coordinator Julie Minter, of Farlington Parish, said: “This is a really exciting project which will bring the community together to discover more about our local heritage. “By working together to research the lives of these men and then responding creatively to their stories we hope that all those involved will feel more connected to these men and never forget the sacrifices that they made to secure peace in our world. The project will culminate in a public exhibition in St Andrew’s Church in November 2018 and the artwork will be unveiled in time for Remembrance Sunday, which this year falls on Armistice Day, 11th November.